Don't risk getting BURNED by going to market for a new Cleaning Service without these valuable tools! 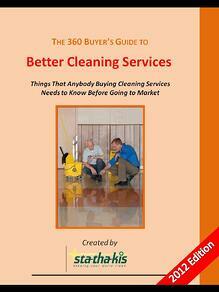 In Stathakis’ newest Ebook, "The 360 Buyer’s Guide to Better Cleaning Services", cleaning industry experts provide key insight into how to navigate through the maze of Cleaning Companies to find the best value for your facility. Evaluate your facilities specific cleaning needs. Protect your company from liability. Read through the pricing game. Ask the right questions when interviewing cleaning companies.